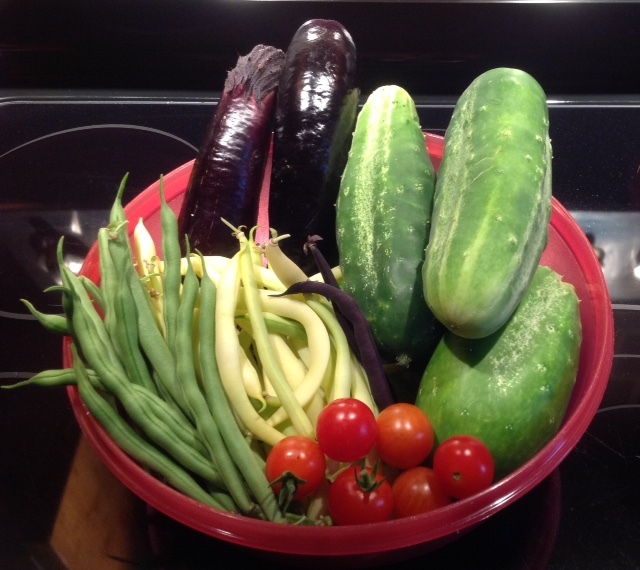 This was last night's harvest from my little garden. I showed it to Carol earlier this morning and she asked me to send it to you in case you want to add it to your website. For the first time ever my tomato plants are taller than I am and my pole beans have outgrown the tower so we had to run rope across the top of the 7 foot fence for them. The only problem has been trying to keep my thriving cucumber plants from strangling the other plants in the adjacent raised beds as they too have grown beyond the frame. Next year we plan to purchase more biochar and use COF to revive the other raised beds and to extend the garden outside of the fence. Tim and I can't thank you enough for the assistance in making this gardening season such a success and reinforcing our belief that maintaining an organic garden is best for us and the environment!